Orkney is known for its healing environment. Every year visitors come to experience its tranquil surroundings, to regenerate body and mind and to find inspiration. The Orkney Islands provide a wonderful selection of therapists working with natural and complementary health therapies, which have long been used by the Orcadian community. If you are looking for a restorative holiday with individualised attention to your relaxation and health needs, there is an abundance of opportunities to enhance your wellbeing. Do you want to release the stresses of work and everyday life? Reiki, shiatsu and aromatherapy massage are at hand to restore a feeling of serenity. Acupuncture, homeopathy and other therapies are also easily accessible. or picked up your case the wrong way: chiropractic, reflexology, physiotherapy and massage are all available. re-energise in the beautiful, calm setting of Orkney. We offer clinical examination and assesment,treatment of injuries, pain management, massage as well as classical reflexology. Guided energy healing on Shapinsay and at the Pickaqouy Centre, Kirkwall. Also remedial massage for persistent muscular pain that does not respond to conventional treatment. The Suilven Centre Offers Natural & Holistic Health therapies in a warm, friendly environment - home to the long-established McTimoney Orkney Chiropractic Group. Experience physiotherapy, acupuncture, reflexology, hypnotherapy, massage & more in a tranquil atmosphere. Facilities for small meetings and seminars. Wheelchair access, car parking and on bus route. 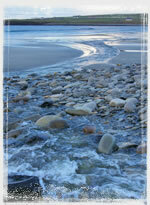 Peagal Burn, Hoy photo © Fraser Dixon, Burn at Skaill Beach photo © Fraser Dixon. Text © Niki Honoré and Kay McCarroll.